Somewhere in America, just after 2 o’clock on a steamy summer afternoon, Donald Trump and Hillary Clinton were out making their rounds, seeking to become a permanent part of the nation’s history. On East William Street in Delaware, Ohio, I was the only person in front of the BP gas station, looking toward a small patch of dirt and sparse foliage. Near the gas pumps, a Bud Light delivery truck had just parked. Its driver, on foot, noisily wheeled some silver-colored kegs of beer past where I stood. Traffic on William Street was fairly heavy, but as far as I could tell not a single motorist glanced over toward the object that had caught my eye. What I was looking at was a weathered plaque declaring that the spot where the pumps stand ($2.05 a gallon on this Midwestern day) was the birthplace of Rutherford B. Hayes, the 19th president of the United States. It has been almost a hundred years since the house where his mother gave birth to him—his father had died during her pregnancy—was torn down. All the frenzied striving by a different crop of candidates every four years for the enduring eminence that comes with the presidency, all the time and hope put into overcoming the odds that will keep all but one from making it to the White House—all of it, as we’re seeing this summer, is so perpetually present-tense and seemingly urgent. And yet. . . The Upper Cut barber shop was next door, a pizza place called Amato’s diagonally across the street. There was a black rubber hose snaked around the base of the plaque, which has been here since 1926 through a succession of different gas-station proprietors. No water emerged from the mouth of the hose, and some of the dirt had cracked in the heat. Only 400 or so people lived in Delaware in 1822, when the baby was born to his just-widowed mother. Hayes is not a president about whom many people give much thought these days. He served a single term, from 1877 to 1881, preceded by Ulysses S. Grant and succeeded by James A. Garfield. But still, when a president comes from a small town, you might think his birthplace would be commemorated in grander fashion. “Indeed,” the head of the Delaware County Historical Society, Brent Carson, told me when I sought him out. “It’s not really befitting of a president of the United States. There’s not even a place on the street for a car to park so a driver can get out.” Is there any presidential birthplace in the U.S. marked as modestly as this one at the gas station? “I can’t imagine,” Mr. Carson said. The cable newscasts on this afternoon were wall-to-wall with reports about Mr. Trump and Mrs. Clinton and their parallel quests to become the 45th president. One day the place where one of them was born will become a draw for sightseers, part of the immortality that automatically accompanies victory. Not that the town is indifferent. Last year a committee was set up to devise a more proper tribute to President Hayes. The chairman of the committee was an 18-year-old senior at Rutherford B. Hayes High School, Cory Beam, who told me that he gave up playing varsity baseball this spring—he was a starting pitcher—to work on the project. Mr. Beam—he’s leaving Delaware to go to college this fall—and his committee recently presented a plan to the city’s leaders. 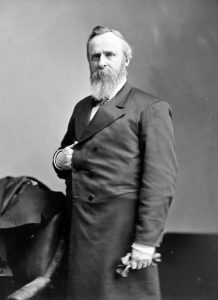 If funding can be found, a statue of Rutherford B. Hayes would be erected in a plaza that would be designed nearby, with a fountain and a place for visitors to sit. Although the plaza would not be on the precise site where Hayes was born, the statue’s eyes would be looking directly at the BP station where the house once stood. From a spot like this one, all the way to the White House. You can get there from here. Mr. Greene’s books include “ Chevrolet Summers, Dairy Queen Nights” (Harper Perennial, 2001).